When you see a butterfly with a gaping hole in its wingspan, you wonder what predator tried to grab it. A praying mantis? A bird? A crab spider or jumping spider? A playful cat or dog? Whatever tried to grab it, it missed. That brings to mind the proverbial saying, "A miss is as good as a mile," dating back to the 18th century. It first appeared in The American Museum, Volume 3, 1788. 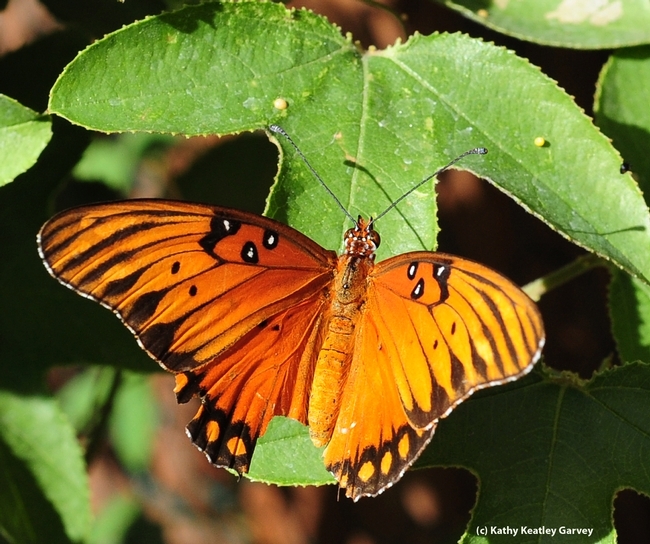 The author wasn't talking about a Gulf Fritillary (Agraulis vanillae) missing a chunk of its wing, but the meaning is the same: a miss, whether as narrow as a strand of hair or as wide as the AT&T ballpark (where the San Francisco Giants clinched their National League championship tonight! ), is still a miss. 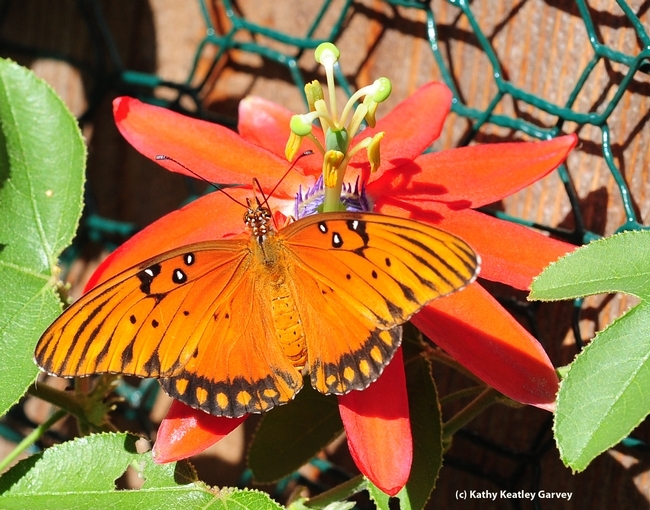 This particular Gulf Fritillary landed on its host plant, a passion flower vine (Passiflora) last Sunday and then fluttered off, only to be replaced by scores of others. They were laying eggs on the plant. One Gulf Frit touched down on the bright red blossom of the triangular-leafed Passiflora manicata, variety Linda Escobar. Its wingspan? Perfect. It may not be tomorrow, though.